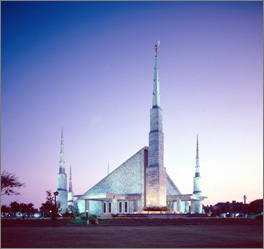 The Dallas Texas Temple is the 30th operating temple of The Church of Jesus Christ of Latter-day Saints. The Church chose the temple site in a quiet residential neighborhood twelve miles north of downtown Dallas. With the announcement of the Dallas Temple, some groups voiced strong opposition to the Church and its teachings. Opposition was voiced in magazines, and there were television and radio programs devoted to warning the Christian community of the so-called "danger of Mormonism." But all efforts were ineffective and the members of the Mormon Church were strengthened in their beliefs, as they renewed their convictions of the truthfulness of the Gospel of Jesus Christ. On October 19, 1984, Gordon B. Hinckley dedicated the Dallas Texas Temple. The temple sits on a site of 6 acres and was originally 18,000 square feet. With the Church growing rapidly, the temple was remodeled in 1987 to increase its size and make it more functional and efficient. The addition gave the temple 22,749 square feet of added space. The Dallas Texas Temple now has a total of 46,956 square feet, five ordinance rooms, and five sealing rooms. This page was last edited on 24 January 2012, at 11:30.